Join up now and get your first 4 lessons for free. 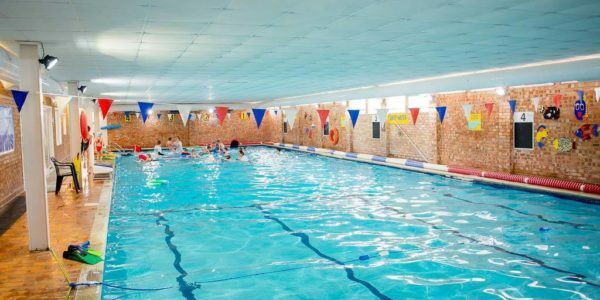 All we need is a £5 admin fee and payment for remaining classes before your first direct debit payment and that will give you a membership card and free access at all public swim times with your child. Existing members can get a 50% discount on their monthly fees by introducing a new school age child to the pool. Take a look at the times available now. Spaces are limited. 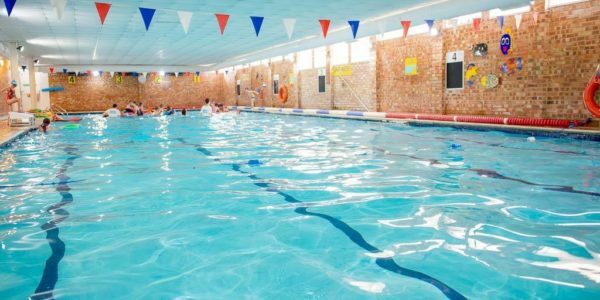 From the first gentle splash to confident swimmer, Shirley Swimming Pool provides an excellent environment to learn to swim. 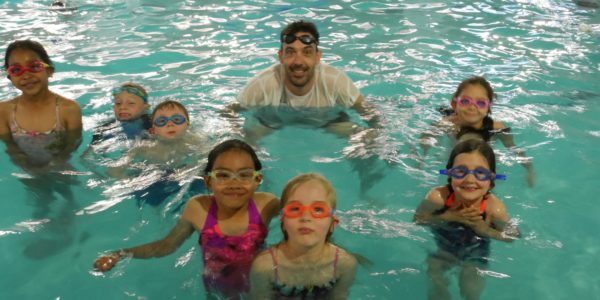 Our unique swim centre provides a class for every age and ability, gently encouraging progression through the learning stages. 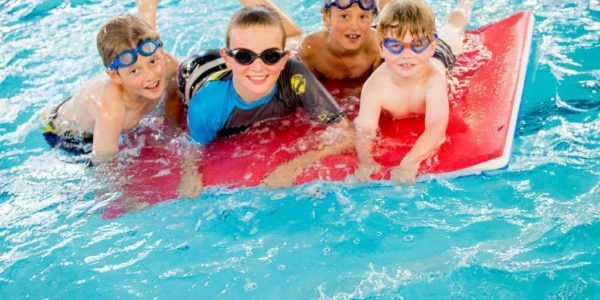 Swimming lessons run all year round, including the summer holidays and term breaks. The only time we are closed is over Christmas and public holidays. Crash course lessons are also available in the half term and end of term holidays. We are proud of our teachers and the lessons. Take a closer look in the videos below. Lessons for children at school take place Monday to Friday every half hour between 3.30p.m. – 6.30p.m and on Saturdays between 8.30 a.m-12 noon. All children’s lessons last half an hour. 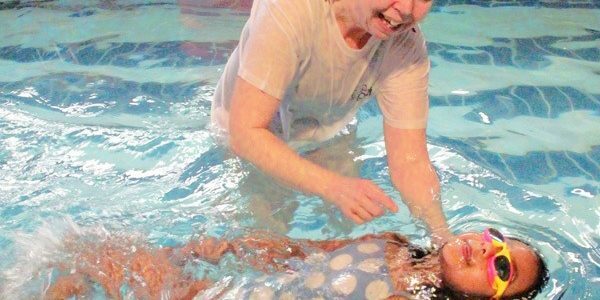 All children’s lessons are taken by an experienced and qualified Swimming Teacher in the water with the children. There are no more than seven children in a class, often less. Depending on the age of the child progress can often be rapid. Assessment for moving up to the next group is continual. This means that the children are constantly being assessed to see if they are ready to progress to the next level. Distance badge testing takes place every eight weeks if their teacher feels they are ready and a ‘Flipper Day’ follows badge week which is always a big hit with the kids. 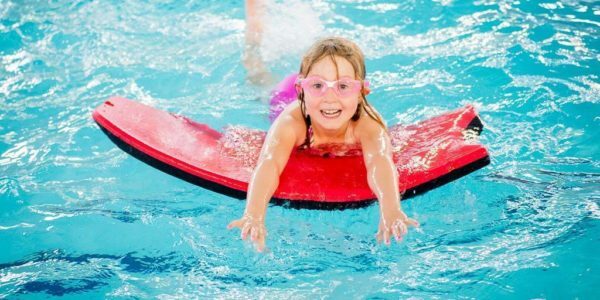 From getting started in the water the aim is for the children to get comfortable face down, floating and gliding. Working towards the Duckling Awards, Water Skills 1 and 5 metres. In this class, the foundations are laid that will allow them to progress rapidly and safely once they are moved up. Breath control underwater, body position and sound leg action on back and front are crucial before moving on. Because all children can stand, there is no need for armbands or other restricting aids. You are able to take and collect the children from the pool as long as you take your shoes off! A remote camera relays the small pool lessons to reception where you can watch without being seen. Every eight weeks the children have the opportunity to try for a badge if the teacher thinks they are ready. All first timers are offered a lesson without charge to make sure that everyone is happy. A detailed list of available times is displayed on the right as a download. Find a slot that fits then call the pool to reserve a place. Complete the direct debit form, also listed on the right, in full and bring it with you. Depending on timing, you would normally need to pay for the first few weeks by card or cash before the direct debit starts. Alternatively you can pop in and see us to arrange a free trial and complete the paper work. The Beginners is the first stage of our after school swim programme for children new to the water. 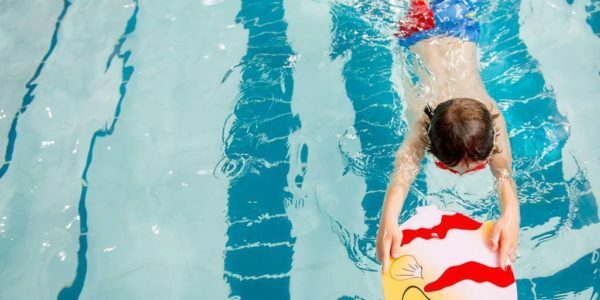 In our small and warm pool, the children start with the basics and learn all of the fundamental skills needed to progress onto the main pool and beyond. From splashing and submersion, to jumping and inversion, they practice their skills until they are swimming on their front and backs up to 5 metres. The first level in the main pool is a big step up – different water temperatures and often a new teacher. All the skills they have learnt in the small pool are reinforced and practiced until they become second nature. Each week they are gently introduced to the deep section in an underwater tea party, until they discover they can swim in deeper water. Once the children are happy with these skills and can attempt a somersault, they are ready to join the stroke classes. In the Tadpoles, 25m on the back using a leg kick is the badge they will complete. The backstroke is improved until they can swim two lengths using the full stroke in comfort. Now they can swim backstroke and are confident underwater, the front crawl is introduced. Once again, simple basic stroke technique is used, rolling onto the back to breath. The emphasis here is correct breathing pattern that will last a lifetime. Later in the lesson program, the children learn just to turn on their side to breath rather that right over onto their backs. These small progressive steps make learning easier and more enjoyable. 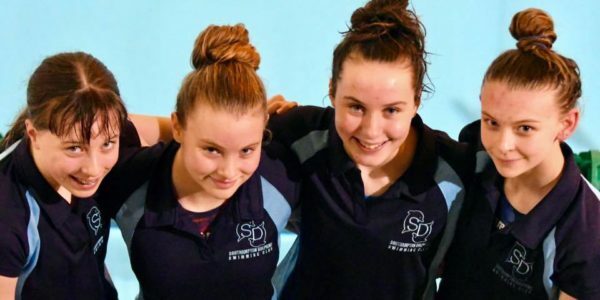 The test to see if they have really learnt the breathing is the 100m badge, which they must swim 25m using basic front crawl and 75m back crawl. Learning to relax in the deep section will have become a regular activity in the previous class. Now they start to learn treading water and diving. The children also work towards ASA Water Skills 2. Building on the basic front crawl technique they have learnt in previous levels, the children will start to learn “proper front crawl”. Rather that turning all the way over to the back, they now turn just halfway to breath on their sides. Its not as easy as it sounds and excellent breath control and co-ordination is needed. If they can’t somersault without getting a nose full of water, this class will be too much for them. Diving progressions continue as a contrasting activity at the end of each lesson, just before their play time. 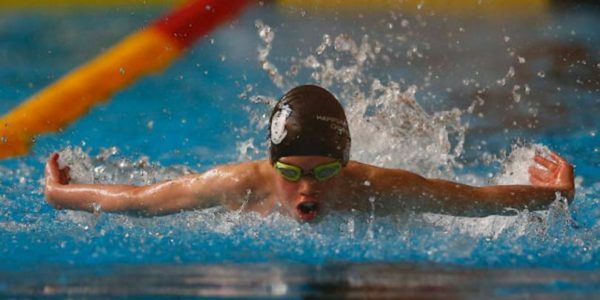 Like every other level before, the core skills needed to develop all round swimming are practiced in the warm up at the start. Water Skills three and 200m are the awards in the front crawl class. With Water Skills three and the first two basic strokes under their belts, the children start breaststroke. This is the most complex of the four strokes and takes longer to master. The children still practice the other strokes at the start of every lesson, though the main theme is the breaststroke, starting with the leg action. Penguin dives now lead onto standing pike dives. All the practice at underwater and somersaults pays dividends now as they try for the Water Skills 4 award. Adding breathing, arms and timing to the leg action takes time and patience. Fast, small hand movements are mastered while wearing flippers, keeping the progression simple. Timing is everything. The end result is a perfect breaststroke that will last a lifetime. Timing is acquired rather than taught so progress is often determined by the children’s application and concentration. If they haven’t already, somersaults will be progressed into tumble turns and penguin dives into elegant standing dives. Quality stroke techniques are reinforced and the leg action developed to increase propulsion. Diving level 1 and Water Skills 4 should have been completed by now. This is the first lesson conducted entirely in the deep section. Unable to stand, the strokes are put under pressure and any weaknesses are ironed out. Butterfly body movement is the key to the stroke. The children have practiced “wriggly worms” at every level, every lesson since the small pool so this relatively simple stroke is mastered with the aid of flippers as stamina levels increase. Water skills 5, Diving Two and Bronze challenge may be attempted in the butterfly class. By now, all four strokes are at a good level and they are ready to be tested over more distance. The children are now ready to join the one hour after school swim club.